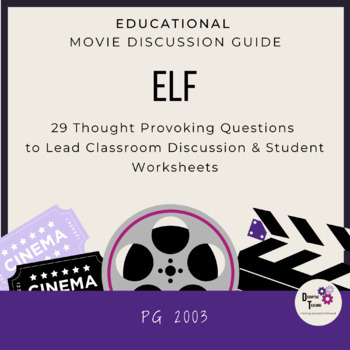 Elf-Movie Discussion Guide- Fun Comprehension Activity! Perfect before Christmas activity! 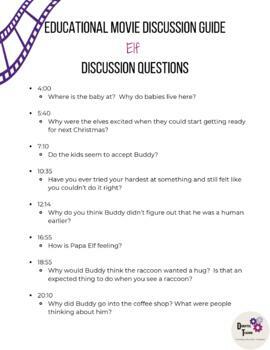 Movie Discussion Guide for the Movie Elf! Spend time learning this Winter with a movie that will grab everyone's attention! 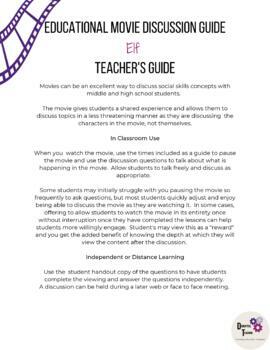 Use movies to teach core concepts, comprehension and social skills with this Movie Discussion Guide. 40+ thought provoking discussion questions, along with the time stamp for each. Check out my other Movie Discussion Guides for Diary of a Wimpy Kid, Holes, Hook, Harry Potter and the Sorcerer's Stone & The Outsiders. If you prefer animated movies- Check out my animated Movie Discussion Guides for Frozen, Inside Out, & Big Hero 6. Look for the green star next to my Store Logo and click on it to follow my store. You will be the first to see new products and will receive email updates on new materials as they are posted!